Grossmont Gardens resident Richard Canner got his Christmas present a little early. It was something that wouldn’t fit under the tree. 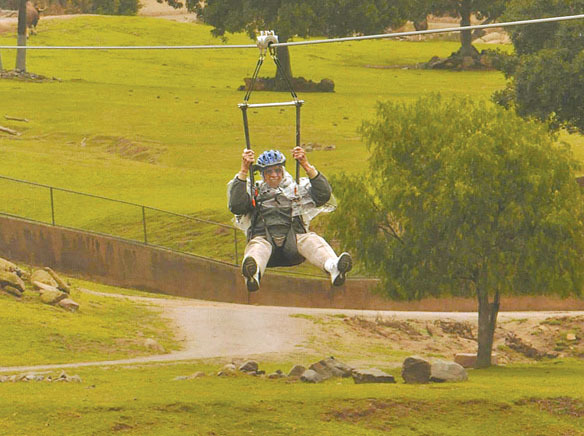 The 88-year-old La Mesan’s wish to have a free­fall experience like bungee jumping was granted when he took a 40-foot zip line ride through San Diego Zoo Safari Park on Dec. 18. It was part of Grossmont Gardens’ Second Wind Dreams program, which grants wishes for senior citizens. There was one thing though that surprised Canner about his amusement park-style ride. Canner was accompanied on his thrill ride by Grossmont Gardens’ community relations director Kris Payne, who shared his once-in-a-lifetime adventure. Payne said it was almost as much fun for her as it was for him. 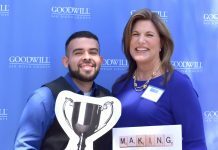 “It was amazing, I felt it was the highlight of my career,” said Payne, a 16-year veteran of Grossmont Gardens who started out as a nursing assistant and worked her way up into public relations, sales and marketing. “It was great to have a one-on-one experience with a retirement center resident, helping them fulfill a personal wish. 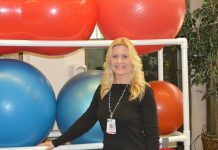 It kind of helped put things in perspective for me, and, coming during the holidays when this job gets very demanding, it was just nice to be able to focus on one resident spending time together,” Payne said. Weather, however, wasn’t cooperative for Canner on the day of his thrilling ride. “It was pouring buckets that day,” said Payne, who added Canner was undaunted, saying he wouldn’t allow “a little rain” to spoil his fun. “We can do it, ok?” Canner said. “It was almost like we had the park to ourselves,” said Payne of Canner’s and her shared experience in the rain-drenched zoo park. One Grossmont Gardens resident is selected each month to participate in the retirement center’s ongoing Second Wind Dreams program. Payne said the “dreams” people want to have fulfilled can be – but aren’t always – as big as Canner’s. They’re as unique as each individual. Another female retirement center resident always wanted to go on a cruise, but her husband was afraid of going on water, so they never did. 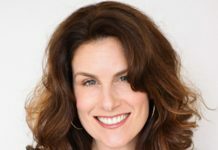 “We took her and a friend on a Hornblower cruise (of San Diego Bay),” said Payne, noting that other dreams fulfilled have included everything from sky diving, to learning to swim, to flower arranging. Canner admits to being “old school.” Noting he’s not big on computers, he still likes to read books and engage in conversation. What’s Canner’s next big challenge? Skydiving?